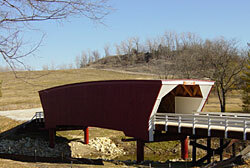 This work will consist of developing, deploying, and using a remote monitoring system for covered bridges in Madison County, Iowa. It is envisioned that with this system, proper authorities could be alerted, in real-time, to possible vandalism and/or arson. Additionally, it is thought that information from parts of the system could be made available to the general public via the internet. Specifically, streaming video of the bridges could be made available worldwide. It is felt that Madison County could use this web interface as a means of drawing attention to these bridges and increasing tourism revenue in the local community. To accomplish this, six general tasks will be completed: threat assessment, literature review, system development, system installation, and long-term monitoring, and final documentation.